Make a pair of homemade Halloween decorations with this easy and thrifty Halloween craft project from Vicki O'Dell. 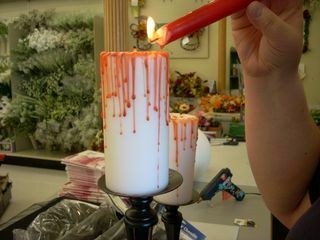 Use candle wax and hot glue to create the appearance of spooky, dripping blood. This is a super easy idea that looks like it takes a lot more work than it actually does. All I did was put a white pillar candle on a black candle holder, light a red candle and let it drip down onto the top and sides of the white candle. Easy! Please don't let children do this craft and make sure to not leave burning candles unattended. First I washed a small fish bowl shaped vase inside and out. Let it dry or set and then go back in and add a layer on top of the first. Do this a few times until you get the look you want.Then I used Flat Black Design Master spray paint and painted only the bottom of the bowl. 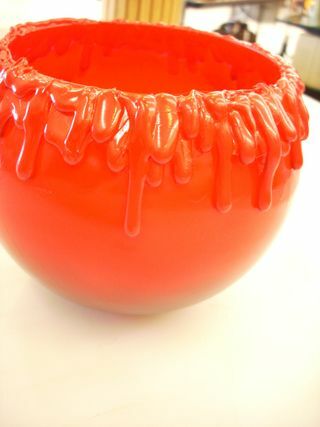 Let the paint lighten and thin out as you go toward the top of the bowl. 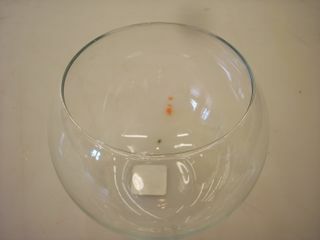 You want it to blend into the red so that there isn't a straight line around the bowl. 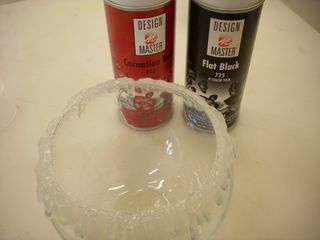 Finally, use the Carnation Design Master and paint the top of the bowl fading down into the black color. It gives your bloody cauldron a little demsion. That's it! 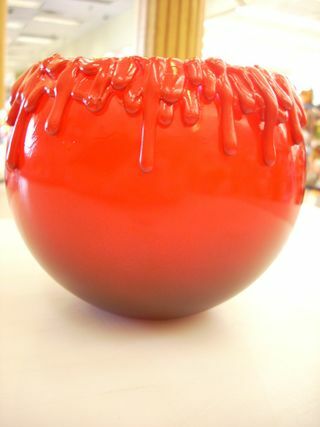 You can use this to hold Halloween candy, a candle or even a small arrangement of flowers. Note: For Christmas paint the bowl white and add Mod Podge and Diamond Dust to the drips to make it look like snow or frost. Paint the whole thing using Design Masters' Dark Chocolate or October Brown for a fun "Bon Bon" look or paint it the color of your room and leave the "drips" out all together to add a vase that coordinates with your decor. What a simple but effective idea for Halloween and cannot wait to try these this year. I think it will give the trick or treaters a giggle too I will leave them in the window (safely of course) so they can see them when they knock in. Im excited to try this. These are both perfect for Halloween. They are easy and inexpensive and come out great. My grand kids will get a kick out of these. They think I come up with the best ideas thanks to you. Some day I may tell them that I didn't think them up all by myself. Great fun for Halloween.Loved to make it. I think it is a great idea. I love the candle, but the bowl it needs more work. I would have some of the drips down further on the bowl and the black a little more up to the middle to make it look more like a cauldron. I think it's really creative. Great to use for a Halloween party. Love the bowl idea and am adding it to my craft notebook. Can't imagine why its controversial... think its a great way to get the melted candle look. 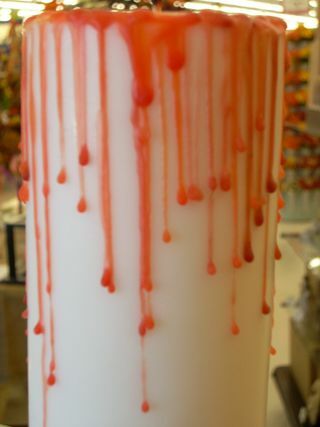 As for the pillar candle we do that all the time with different colors and with the "drip" candles. Like the candle better than the bowl.